With the primaries behind us – and a single special election coming next month in the 74th House district – it’s time to take a first look at the upcoming November elections. All 100 seats in the House of Delegates and all 40 seats in the Senate will be on the ballot, although not all will be contested races. According to VPAP, there will be at least two candidates in 37 house races and 23 Senate races. It goes without saying that not all of these contests will be competitive. 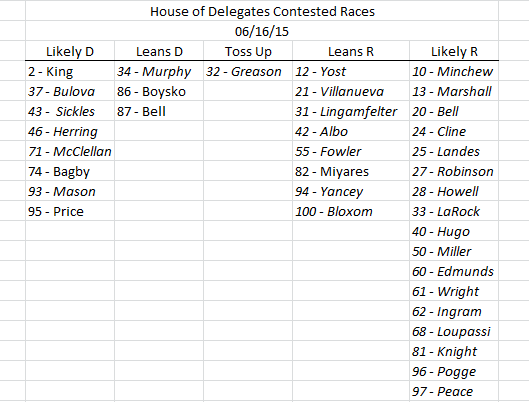 In this first pass, I’ve categorized all of the contested races as likely, leans or toss up. In the future, I’m going to remove all of the safe seats (currently included in the “likely” category) and concentrate solely on the competitive contests. 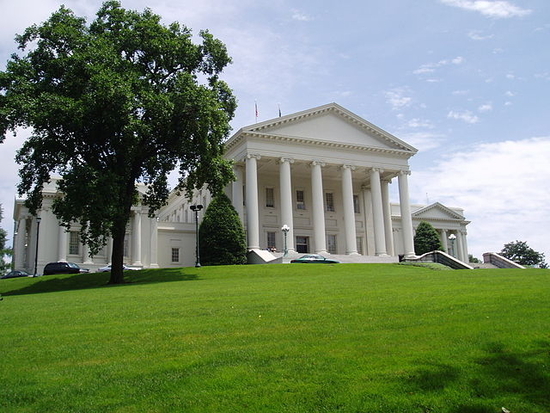 “Housediagram 2015 State of Virginia” by Deturtlemon1 – Own work. Licensed under CC BY-SA 4.0 via Wikimedia Commons. Republicans currently hold 67 seats while Democrats hold 33 (including the 74th). This fall’s elections will not change significantly the hold Republicans have. Of the 37 contests, just 6 are seats in which no incumbent is currently running. (That may change: in District 2, the Democratic incumbent resigned to run in a primary for Senate. The current candidate is withdrawing and it is possible that the previous occupant, Michael Futrell, may be named the replacement.) Of the six seats lacking an incumbent, four have major party opposition. Three of these seats – 2nd, 74th and 95th – were last represented by Democrats; it is expected all of these seats will remain in the Democratic column. The other three – 82nd, 86th and 87th – were last represented by Republicans. While the 82nd is a strong Republican district, that is not the case for the other two. At this time, Democrats should pick up the other two seats. Six incumbent Democratic delegates are being challenged and five of them have Republican opposition. Democratic margins in prior elections make all but the 34th likely holds. The 34th is not as strong a Democratic seat as the others and the Republican candidate there is doing quite well in fundraising. Twenty-five incumbent Republican delegates are being challenged; 20 of them face Democratic opposition. In the 12th and 21st districts, election results show a Democratic lean. Five seats – 31st, 32nd, 42nd, 94th and 100th – are virtual toss ups with slim margins between the two parties. Incumbency, though, makes all but one of these seven seats lean towards Republican hold. I consider the 32nd the sole true toss up among the House contests. 32nd – Swing district, challenger came very close last cycle. 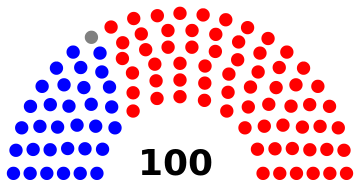 “Senate diagram 2014 State of Virginia” by Shabidoo – Own work. Licensed under CC BY-SA 4.0 via Wikimedia Commons. The Senate is where the real battle – and money – will be this fall. Currently, Republicans hold 21 of the 40 seats. 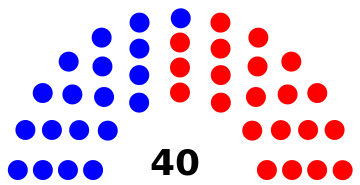 A single seat pickup by Democrats will return control of the chamber to them, due to the presence of a Democratic LG providing the tie-breaking vote. Seven of the 23 contested seats have no incumbent on the ballot. Six of these – 8th, 10th, 12th, 19th and 29th – are open seats due to retirements while the 7th (district 11) is the result of last week’s primaries. All except the 29th were represented by Republicans in the last session. Except for the 10th, I currently expect the respective parties to hold these seats. The 10th is the one contest that I consider a toss up. Looking at election results, this district could go either way. No incumbent is a plus, as is the fact that there are four candidates in the race. At this time, I’d say control of the Senate hinges on this race. Ten Democratic incumbents are being challenged, with 7 of them having Republican challengers. Six Republican incumbents are being challenged, all with Democratic opposition. I do not anticipate any of these seats changing hands. What is your opinion of the 29th Senate race? Harry Parish (R) vs. Jeremy Mcpike (D)? I have that race as leans D right now. Thank You. My understanding was the primary vote turnout for the democrats was extremely low there. I find it arguably one of the most interesting races since their seems to be a high degree of republican cohesion there on their nominee.